Thomas made a Toulouse Wiki. For mostly english-speaking people to gather what they know about the town of Toulouse. Great idea. I promptly went and added a couple of things, like a link to myself. Browsing around, seeing what other people had added, I noticed the link to the Wikipedia page about Toulouse, which I hadn't seen before. And it gives an absolutely excellent overview of what the city is about, with important facts and figures and recently history. 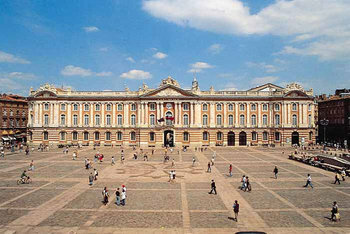 Toulouse is the 4th largest city in France, and the largest growing metropolitan area in Europe for a city around a million inhabitants. That to a large degree is because it is the center of the European aerospace industy, and also a big bio-tech center. Toulouse has at various times in the last couple of thousand years been an important metropolis. But, interestingly, Toulouse was largely overlooked by the industrial revolution. So, in the 18th and 19th centuries it became just a sleepy, decaying provincial town. That's all different today, and is now a great asset, as there's no polluting heavy industry here at all. I'm so glad I didn't choose Lyon. Jeeze, man, you weren't here when the AZF factory exploded!!!!! OK, well, it blew up, so it isn't here anymore, eh? OK, I was in a really rosy mood, so I was trying to be positive. Yes, this place isn't entirely without industry, and some of it is obviously dangerous. But in general there's a nice absence of smoking factory chimneys. Ah, looks like that one could need a little help having more information. I'm glad not all conferences are in San Francisco. a head of romaine, in dollars. c'mon ya want some americanski neighbors, don't you funch? Heheh, sure. Yeah, it is hard to give a really good impression how it is. When I was trying to research Toulouse before we moved I couldn't really find a whole lot. Yeah, some general history and some tourist pictures, but that didn't really tell me how it is. So, yeah, I've gotta make a better effort of presenting that.